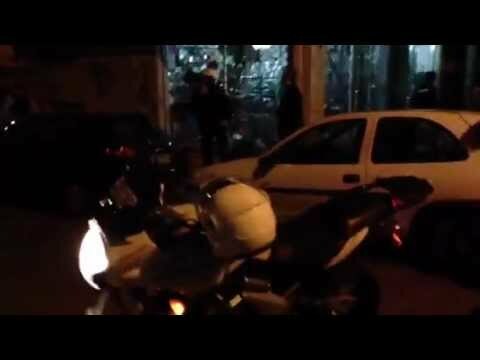 Two groups calling themselves Informal Anarchist Federation-International Revolutionary Front and Intact Revolutionary Cell on Friday claimed responsibility for a bomb attack on a courier service in Pangrati, central Athens, last Sunday that caused damage but no injuries. The makeshift bomb, which comprised several gas canisters and some explosive material, went off outside the offices of the courier service on Astydamantos Street shortly after 10 p.m. on Sunday when the offices had been empty and caused minor damage to adjacent buildings. In a proclamation uploaded onto the Internet, the groups heralded a “war against the system,,” expressed solidarity with jailed members of the guerrilla group Conspiracy of the Cells of Fire and threatened to target police officers and judges in future hits. “All the creeps, cops, judges and prison guards that have hurt or insulted our comrades should know that they will not be forgotten,” the statement said. “One night they will receive one of our unwelcome visits, with bullets, bombs, brass knuckles.”. The Hellenic Security Advisors observe that any ordinary law-abiding citizen may be a target of a terrorist attack as opposed to the terrorist activities of past decades how used to focus solely on politicians, journalists and VIP in general. Το άρθρο δημοσιεύτηκε Παρασκευή, Μάρτιος 15th, 2013 στις 22:41 στην κατηγορία ΤΡΟΜΟΚΡΑΤΙΑ. Μπορείς να παρακολουθείς τα σχόλια χρησιμοποιώντας το RSS 2.0 feed. Τα σχόλια είναι κλειστά, αλλά μπορείς να αφήσεις ένα trackback από το site σου.